The Sovereign ‘Wayfarer’ combi really can be loaded single handed! The swinging double roller on the axle supports the hull, and the side rollers ease the trolley into position as the boat slides on. The equipment level includes a cradle moulded glass fibre chock which fits Mk1 and Mk2 hulls. 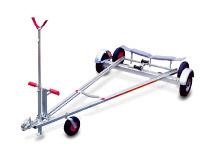 There is a jockey wheel take off on the trailer and the trolley. Double sealed hubs are supplied as standard. (15)… Lighting board fitted and tested….